Heat 150ml of the oil in a large non-reactive pan. Add the shallots and onions and cook until soft. Do not colour. Add the garlic after 5 minutes. Keep the ingredients in the pan moving as you add the rice, herbs, sultanas, pine kernels and lemon juice. Season. Add the water. Cover the pan and simmer for 10-15 minutes or until the rice is cooked. Stir once or twice. Remove from the heat and cool. Meanwhile, soften the vine leaves in boiling water (it will take 8-15 minutes), drain and refresh in cold water. Allow to cool. Mix the mackerel or kipper with the rice. Place each leaf, shiny side down, on a board and add 2 teaspoons of the rice mix. Roll halfway up then turn the sides in and continue rolling to make a neat parcel. 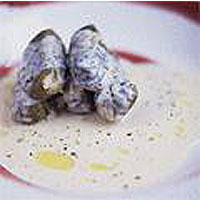 Dress the dolmades with the remaining 50ml oil, then refrigerate. They'll keep for up to a week. Return to room temperature before serving. To make the sauce, whisk the egg whites in a heatproof bowl until stiff. Incorporate the warm vegetable stock, whisking all the time. Then, whisking, add the yolks, a little at a time, the lemon juice and dill. Put the bowl over a pan of boiling water and continue stirring until the sauce thickens (5-6 minutes). Season. Pour over the dolmades.